"How is it possible then to free ourselves from the psychological structure of society, which is to free ourselves from the essence of conflict?" 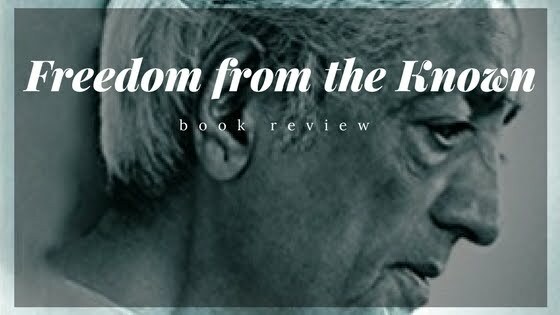 Freedom from the Known is a book which does not only motivate the readers to lead a life without any regrets of attachments but also educates them practically on what to do to make it possible. In a sense, we all know that achieving a living nirvana is impossible; we all do agree that being truly detached is impossible unless you quit and quit entirely. Still, in this book, J Krishnamurti focuses on the concept of seeing what you want to see and seeing what it is. He takes the example of a tree and tries to educate his listeners that seeing a tree every day and suddenly not finding it one day might create a wanderlust in the observer. If one just sees the tree and enjoys seeing it rather than attaching oneself to the tree - how beautiful it is? It should be there every day so that I enjoy it. The book has been divided into 16 chapter and each of the chapters deals with different aspects of human life. The abstract ideas are dealt in detail. The ideas like anger, fear, passion, self-concern, craving for position, relationship, society, social barriers, and many things which build human ecosystem have been dealt in the book very well. In short, Freedom from the Known can surely be a very nice pocketbook for the lovers of spiritual literature who want to have an opinion on their life. J Krishnamurti has tried to offer to his followers and readers something which they want to know more and more. This book might well suggest them how to lead a happy life as well. Get this book from the Amazon India link below and enjoy reading it.